Mosques commonly serve as locations for prayer, Ramadan vigils, funeral services, Sufi ceremonies, marriage and business agreements, alms collection and distribution, as well as homeless shelters. Historically, mosques were also important centers of elementary education and advanced training in religious sciences. In modern times, they have preserved their role as places of religious instruction and debate, but higher learning now generally takes place in specialized institutions. Special importance is accorded to the Great Mosque of Mecca (center of the hajj), Prophet's Mosque in Medina (burial place of Muhammad) and the Al-Aqsa Mosque in Jerusalem (believed to be the site of Muhammad's ascent to heaven). In the past, many mosques in the Muslim world were built over burial places of Sufi saints and other venerated figures, which has turned them into popular pilgrimage destinations. The first mosque was built by Muhammad in Medina. 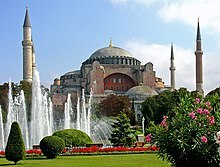 With the spread of Islam, mosques multiplied across the Islamic world. Sometimes churches and other temples were converted into mosques, which influenced Islamic architectural styles. 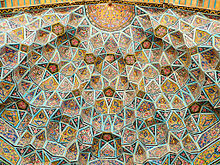 While most pre-modern mosques were funded by charitable endowments, modern states in the Muslim world have attempted to bring mosques under government control. Increasing government regulation of large mosques has been countered by a rise of privately funded mosques of various affiliations and ideologies, many of which serve as bases for different Islamic revivalist currents and social activism. Mosques have played a number of political roles. The rates of mosque attendance vary widely depending on the region. Mosques from the Ottoman period are still scattered across Eastern Europe, but the most rapid growth in the number of mosques in Europe has occurred within the past century as more Muslims have migrated to the continent. Many major European cities are home to mosques, like the Grand Mosque of Paris, that incorporate domes, minarets, and other features often found with mosques in Muslim-majority countries. The first mosque in North America was founded by Albanian Americans in 1915, but the continent's oldest surviving mosque, the Mother Mosque of America, was built in 1934. As in Europe, the number of American mosques has rapidly increased in recent decades as Muslim immigrants, particularly from South Asia, have come in the United States. Greater than forty percent of mosques in the United States were constructed after 2000. The late 20th century saw an increase in the number of mosques used for political purposes. While some governments in the Muslim world have attempted to limit the content of Friday sermons to strictly religious topics, there are also independent preachers who deliver khutbas that address social and political issues, often in emotionally charged terms. Common themes include social inequalities, necessity of jihad in the face of injustice, the universal struggle between good and evil, with the West often symbolizing moral and spiritual decadence, and criticism of local rulers for corruption and inefficiency. In Islamic countries like Bangladesh, Pakistan, Iran, and Saudi Arabia, political subjects are preached by imams at Friday congregations on a regular basis. Mosques often serve as meeting points for political opposition in times of crisis. Countries with a minority Muslim population are more likely than Muslim-majority countries of the Greater Middle East to use mosques as a way to promote civic participation. Studies of US Muslims have consistently shown a positive correlation between mosque attendance and political involvement. Some of the research connects civic engagement specifically with mosque attendance for social and religious activities other than prayer. American mosques host voter registration and civic participation drives that promote involving Muslims, who are often first- or second-generation immigrants, in the political process. As a result of these efforts as well as attempts at mosques to keep Muslims informed about the issues facing the Muslim community, regular mosque attendants are more likely to participate in protests, sign petitions, and otherwise be involved in politics. Research on Muslim civic engagement in other Western countries "is less conclusive but seems to indicate similar trends." Bombings in February 2006 and June 2007 seriously damaged Iraq's al-Askari Mosque and exacerbated existing tensions. Other mosque bombings in Iraq, both before and after the February 2006 bombing, have been part of the conflict between the country's groups of Muslims. However, mosque bombings have not been exclusive to Iraq; in June 2005, a suicide bomber killed at least 19 people at an Afghan Shia mosque near Jade Maivand. In April 2006, two explosions occurred at India's Jama Masjid. Following the al-Askari Mosque bombing in Iraq, imams and other Islamic leaders used mosques and Friday prayers as vehicles to call for calm and peace in the midst of widespread violence. A study 2005 indicated that while support for suicide bombings is not correlated with personal devotion to Islam among Palestinian Muslims, it is correlated with mosque attendance because "participating in communal religious rituals of any kind likely encourages support for self-sacrificing behaviors that are done for the collective good." Before the five required daily prayers, a Mu’adhdhin (Arabic: مُـؤَذِّن‎) calls the worshippers to prayer from the minaret. In many countries like Singapore where Muslims are not the majority, mosques are prohibited from loudly broadcasting the Adhān (Arabic: أَذَان‎, Call to Prayer), although it is supposed to be said loudly to the surrounding community. The adhan is required before every prayer. However, nearly every mosque assigns a muezzin for each prayer to say the adhan as it is a recommended practice or Sunnah (Arabic: سُـنَّـة‎) of the Islamic prophet Muhammad. At mosques that do not have minarets, the adhan is called instead from inside the mosque or somewhere else on the ground. The Iqâmah (Arabic: إِقَـامَـة‎), which is similar to the adhan and proclaimed right before the commencement of prayers, is usually not proclaimed from the minaret even if a mosque has one. ^ a b c d e f g h i j k l m John L. Esposito, ed. (2014). "Mosque". The Oxford Dictionary of Islam. Oxford: Oxford University Press. ^ a b c d e Nuha N. N. Khoury (2009). "Mosque". In Juan Eduardo Campo (ed.). Encyclopedia of Islam. Infobase Publishing. ^ a b c d e Patrick D. Gaffney (2004). "Masjid". In Richard C. Martin (ed.). Encyclopedia of Islam and the Muslim World. MacMillan Reference. ^ a b c d e f Hillenbrand, R. "Masdjid. I. In the central Islamic lands". In P. J. Bearman; Th. Bianquis; C.E. Bosworth; E. van Donzel; W. P. Heinrichs (eds.). Encyclopaedia of Islam Online. Brill Academic Publishers. ISSN 1573-3912. ^ Eade, John (1996). "Nationalism, Community, and the Islamization of Space in London". In Metcalf, Barbara Daly (ed.). Making Muslim Space in North America and Europe. Berkeley: University of California Press. ISBN 978-0520204041. Retrieved 19 April 2015. As one of the few mosques in Britain permitted to broadcast calls to prayer (azan), the mosque soon found itself at the center of a public debate about “noise pollution” when local non-Muslim residents began to protest. ^ a b Aubrey Westfall (2018). "Mosques and political engagement in Europe and North America". Project on Middle East Political Science. ^ a b "China mosque demolition sparks standoff in Ningxia". bbc.com. BBC News. 10 August 2018. Retrieved 8 April 2019. ^ a b c Osborne, Samuel (10 August 2018). "Thousands of Muslims protest China's plans to demolish mosque in rare demonstration against government". independent.co.uk. Independent. Retrieved 8 April 2019. ^ Harris, Rachel (7 April 2019). "Bulldozing mosques: the latest tactic in China's war against Uighur culture". theguardian.com. Theguardian. Retrieved 8 April 2019. ^ Hillenbrand, R. "Manara, Manar". In P.J. Bearman; Th. Bianquis; C.E. Bosworth; E. van Donzel; W.P. Heinrichs (eds.). Encyclopaedia of Islam Online. Brill Academic Publishers. ISSN 1573-3912. ^ "Fiqh of Masjid & Musalla". Qa.sunnipath.com. 2005-07-03. Archived from the original on 2011-10-19. Retrieved 2011-11-03.